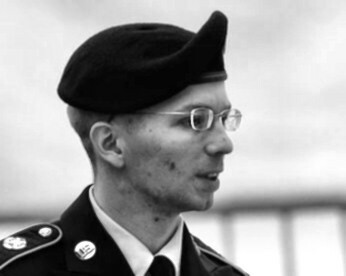 As anticipated as a conviction was, today’s news of the federal state winning convictions against Bradley Manning on all counts except the excessive, absurd, and unjustifiable charge of “aiding the enemy,” is still very sad news. For Bradley Manning, the consequences could still be extreme, with some estimating that he could face a maximum total of 136 years in prison for the charges of which he was convicted this afternoon. Yet, even now, and under such awful circumstances, Bradley Manning stands tall and gives meaning to the reality of U.S. imperial wars: there will be no justice for the victims of its many war crimes. Other meanings may come out of this, depending on the actors in question: to gain any justice, there will need to be resistance on all fronts, including violent confrontation; that the legal system does not work when exposing and punishing war crimes, it only works when punishing those responsible for the disclosures; and, that when U.S. political leaders repackage the megalomania of “Manifest Destiny” in various bags of hot air about freedom, democracy, human rights, and so forth, that they will continue to earn ever greater amounts of contempt and rejection, as we are already past the stage of damaged credibility. Those deserving of the mightiest acts of grateful recognition, have instead been prosecuted in greater numbers under Barack Obama than all of his predecessors combined. In contrast with Manning, Obama now stands out even more for his villainous and murderous “accomplishments” which come at the expense of both the life and liberty of those who would pursue saner approaches toward the world. While it is easy, and even well warranted, to be pessimistic about the outcomes of the sentencing and appeals phases, or about the impact of public protests, I personally do not want to forget here to say my many thanks to Bradley for his real bravery. Bradley refused to be used as a mere tool in a giant, global killing machine. He refused to allow himself to become part of the procedural order that obstructs justice on a daily basis. He set an example of what it means to devote one’s self to the pursuit of truth. Were it not for Bradley’s disclosures, published by WikiLeaks, a great deal of valuable knowledge would not have been gained, as contained in numerous articles on ZA, or other articles by myself in other venues, not to mention a significant core of the research that formed part of Slouching Towards Sirte. By now, thousands upon thousands of pages have been published by countless writers, that relied in whole or in part on the disclosures by Bradley. This whole experience of the last three years formed a key part of what I argued elsewhere is a new research method for an anthropology that studies up and takes elites, powerful authorities, and military officials as the focus of its study of power and secrecy, or what I called “WikiLeakism”. Having said that, no number of years in prison for Bradley Manning can ever reverse that. The state, on the basis of rights arrogated to itself, now exercises its right to cruelty and punishment. Our job, unlike that of the frauds and quislings who dreamed of launching or supporting the failed-from-the-start “OpenLeaks,” is to make sure that Bradley’s sacrifice is not in vain.